This sounds very interesting and hopefully I'l be able to listen to some of it, at least (maybe not until 3.00 am though!). A kaleidoscope of musical genres, which can only be described as Ambiavantelectroexperifolkgothjazprogpsychwave. This will be fun! I'm thrilled to be a part of it. great poster as well mark.. thanks! has anyone posted these at other sites and forums? I have posted this poster in several forums. By the way, that is a satellite picture of the surface of Mars. Great guys. 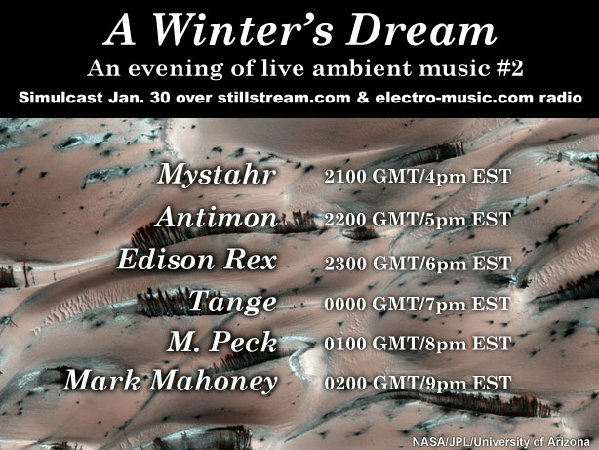 Looks like a nice evening of music. Look forward to this. I love the poster and the Mars surface shot. Very approiate. made a note in my calendar. looking forward to listening to our music. Looks like there truly will be a winter's night here for Michael and me. Friday/Saturday's weather is predicted to be 8-10 inches of icy snow. My wife heard that a fellow from The Weather Channel arrived at our airport. Regardless, we are both looking forward in presenting a great performance for everyone listening. me as well... currently enduring freezing rain... snow is to come in the morning. just hope i have power to listen saturday. A big THANK YOU for the awesome performances, for the smooth flow from one set to another, for the sites that streamed the concert. It was truly a listening pleasure and one that I won’t soon forget. Thank you to everyone that had a part in putting on this concert. It was a lot of fun. Talk about running smoothly! Thanks to all who had a hand in putting this event together. Had a lot of fun too. Glad I could actually do a live set for a change, rather than pre-recorded. Great job from Jez and DK. Yeah thanks all! I had a great time, performing but especially listening to the great stuff you guys put together. Also, a smooth operation - nice work with the stream - and thanks to all chatters making the event a great time. On the Nord Modular G2 I went through six performances in sequence. I've patched them together over the last couple of weeks - one (the guitar looper) I used on new year's event. I had a granular sample player written in ChucK running throughout the set, sampling my singing, whisteling, harmonica playing and Bebot playing, chopping the input up and playing back in a randomized fashion. I used a guitar with and without E-Bow, processed by the G2. Also a piano went into the G2 at times. PEK, Ion and an old Nord Modular Key were used sparsely for incidental tones. My Curetronic and SoundLab Ultimate were used for a rumbling sound. I think this is the first time I've listened to my recording afterwards without whincing hard at some details. It was fun! You all made my day just great .... BIG THANKS !!!!!!!!!! I very much enjoyed playing as well. Big thanks to Jez and DK for their efforts. Here's my set. Program notes are, main instrument is a EWI 4000s, played through a Colorsound Overdrive and a EHX Memory Man, drones provided by Trope on the iPhone, and some Neuron and piano, and a low bass drone from the Wretch. Also some winter ambient sounds courtesy of resonance for mac. I too had a great time playing. This was the first broadcast out of my home and definitely not the last. Most of my set was improv; just letting it take me down a dark and twisting path. Thanks to everyone in the background that kept things running smoove. I'll try to post this asap. Hope you all like my performance. I used a Moog Voyager, Korg ESX-1, Ableton Live with Reaktor, Thesys, and Absynth. My midi controller was the Akai MPK 49. No wonder I got a bit of hum! Nice set, Stefan! I like the rumbling and the buzzy-sounding pad that comes in later.